Though not fully supported in all browsers, CSS3 pseudo class selectors are really powerful and exciting. I’ve been using the basic CSS pseudo classes (e.g., a:hover) for ages, but I’ve only recently started using other pseudo classes, particularly the position/number-based ones. This entry was posted in CSS, Learning Resources and tagged css, CSS3, Pseudo classes on September 30, 2013 by abonham2012. A commonly desired feature on websites is an expanding/collapsing list, with a rotating arrow button. 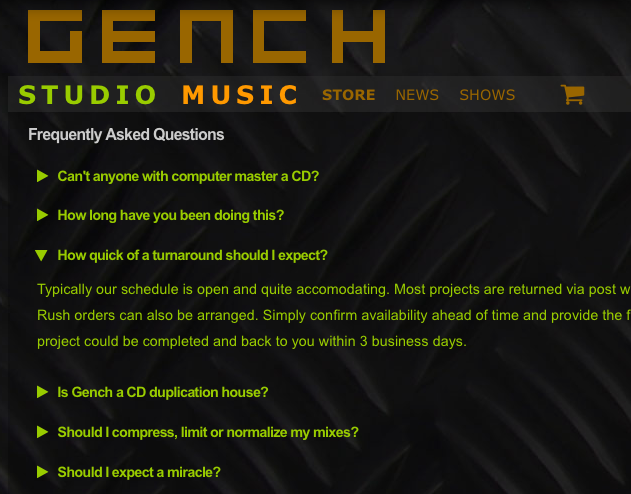 I want this feature on both the gench FAQ and album review pages, and I want the currently expanded section to collapse if another section is expanded or if the currently expanded heading is clicked on again.